Photobashing is a technique where artists merge & blend photographs or 3D assets together while painting and compositing them into one finished piece. This is used by concept artists to speed up their workflow and achieve a realistic style. Some people think of photobashing as ‘cheating,’ but to use this technique successfully you have to have a functional understanding of lighting, composition, and form. Artists do not ignore fundamentals with photobashing. Instead they use their knowledge and skillset to speed up project work and achieve a finished result faster. Photobashing allows concept artists to work faster than usual and reach higher levels of detail by adding realistic photo elements into their environments, characters, or props. For example, if your project is set in a real location(like New York) it’s much faster to adapt a photograph than it is to paint from scratch. 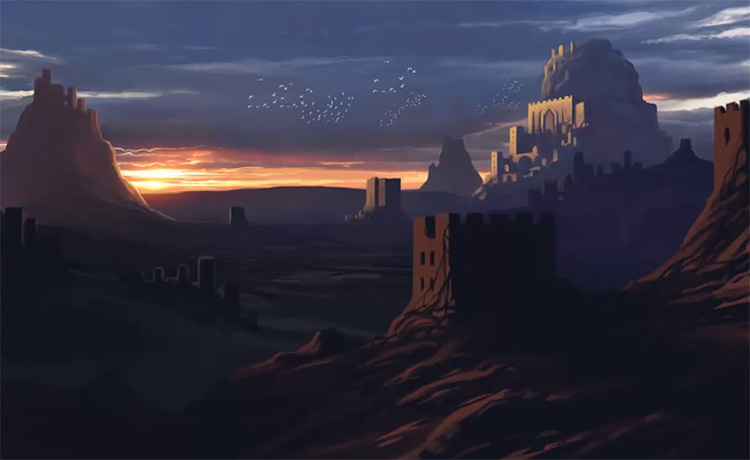 A concept artist will begin with a sketch or base photograph, then use their painting abilities to add and custom elements that make everything fit together. A crowded New York street could be transformed into a desolate warzone with a few finishing touches. Sometimes artists will also use 3D assets they render in software like Blender to merge with digital paintings. 3D elements + real photos make up the majority of photobashing resources. Photobashing is digital art and it’s created in software like Photoshop, although some artists use different programs. You can use it for designing realistic objects, creatures, costumes, sets(backgrounds), and entire worlds. Photobashing was developed primarily by game concept artists who need to work fast. You could use this technique if you want your artwork to look a little more realistic, or if you are on a tight deadline for a digital piece. Concept artists are responsible for the look of every object in a film or game. From guns to trash cans, everything needs to be visualized by an artist. The sheer amount of artwork required in any production is an overwhelming amount for any team. Photobashing helps speed along the process. Note the use of photos is not a substitute for artistic ability, but rather a way to expedite the painting of highly realistic images. Most professionals who use photobashing are confident artists who could create similar designs and concepts without the aid of photographs. When an artist photoshops an image they augment it and ultimately change it, but keep the underlying structure. For example, editing someone’s nose to be smaller is photoshopping a photograph. Photobashing is much more creative than photoshopping and requires multiple photos be ‘bashed’ together and painted over. If you were to take a small-nosed head, merge it with a photo of a girl in a dress, and then paint in a glowing wand, you’d be photobashing. For all those elements to work together you need to do a fair bit of painting, changing the lighting, and integrating details to create a believable finished product. Photobashing is an art form created digitally but it is not true digital art. Digital artists create their work from scratch with little-to-no outside additions. They often reference photographs for gestures, colors, lighting, and for inspiration, but do not use them directly in their artwork. Some digital art contests will actually reject entries if they are photobashed. Many artists feel that concept art is in a category of its own because its primary purpose is design and visualization. This means the pure artistic vision comes secondary to the finished design and the ideas conveyed in a concept piece. There has been plenty of debate in the artistic community about the legitimacy of photobashing as an art form. But most do agree it takes skill to produce a good picture. The most popular software for this type of work is Photoshop. This is also true for anyone getting into digital painting since Photoshop really is an industry standard. 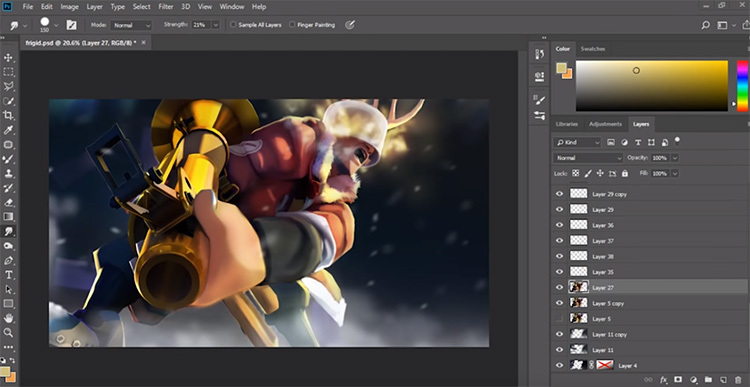 Unlike other digital art software, Photoshop has specific tools to help you alter photographs and paint with digital brushes. Using Photoshop’s customizable brush set, clone brushes, and layer styles, you can blend photos seamlessly into digital artwork. Finding the right photo for your artwork is a time-consuming process. You need high-quality, sharp images that are easy to work with and cut out. Use a professional stock photo website when looking for photos on a deadline. It’s always best to use high-quality stock images as you won’t have to worry about copyright infringement or deal with pixelation problems. There’s also plenty of free image sites like WikiMedia Commons that you can search through as well. Between the two I’m more partial towards Krita because it feels more like a painter’s application. You can learn it pretty fast with free tutorials too. However both of those programs run on all operating systems and they can both handle basic photo bashing combined with digital painting. So now that we know what photobashing is… maybe give it a try? It’s not as easy as cutting and pasting one picture on top of another. It does take work and you have to know how to paint over them, add to each image, and change certain features like lighting. These free tutorials are decent introductions for newbies and will show you how to get started with some basic photobashing techniques. In this beginner video you’ll learn the fundamental principles of photobashing. Starting with a rough illustration, the artist shows you how to add realistic textures without wasting any time. He textures a crow using several photographs, aligning them without creating a tiled pattern. Using photoshop the textures are blended with the illustration using a mixture of layer styles and brush strokes. This tutorial won’t teach you how to create a full scene, but it will introduce you to one vital component of photobashing—combining textures. This 90-minute tutorial teaches you how to develop creature concepts and build a final scene using photobashing. The tutorial begins with the conceptualization stage. Various creature concepts are quickly sketched until the artist finds one he likes. Then he grabs pieces of photos and layers them on top of his drawing, blending and painting as he goes. The blending stage is lengthy with segments continuously added and adjusted. A simple background and additional character complete the final artwork. The artist talks you through his entire process teaching you how to achieve the same look on your own. Conceptualizing realistic fantasy landscapes is where photobashing techniques really shine. Here you’ll learn how to develop a deserted dystopian factory concept from nothing. By joining images together this video teaches you how to construct the design you need to fit your composition. It’s also careful to explain each step and cover the techniques in detail along the way. You’ll learn how to select the perfect stock images, quickly isolate the elements that you want, and integrate them using Photoshop blend modes. The tutorial starts off slowly explaining the basics of combining images, but ends with complex tips diving into lighting and brushwork. If you’re comfortable painting in Photoshop you can easily follow along and create a very similar landscape. If you’d really want to get into photobashing don’t let these tutorials be the end! Browse through YouTube and see if anything else can get you up-to-speed with this technical artistic process.